The DIVERSE project – Diversity Improvement as a Viable Enrichment Resource for Society and Economy, co-funded by the European Integration Fund and coordinated by the WWELL Research Centre of the Catholic University in Milan (with the scientific direction of Laura Zanfrini, full professor of Migration Sociology and person in charge of the Economy and Labor Department at the ISMU Foundation) was realized in collaboration with 14 partners in 10 European countries: Estonia, Finland, Germany, Italy, the Netherlands, Poland, Portugal, Spain, Sweden, and Hungary. As a partner of the project, the ISMU Foundation coordinated the dissemination activity, carried out through a rich program of seminars and workshops addressed to different categories of stakeholders, and the participation in several international conferences. The overarching and long-term objective of the project DIVERSE is to reinvent the European – and Italian – approach to migration, overcoming its traditional contradictions. Beside promoting the shift from a perception of migrants as a contingent and instrumental resource to the idea that their human capital represents a structural resource for the EU social and economic development, DIVERSE was intended to propose a more mature model of integration, where the promotion of migrants’ economic inclusion is combined with the support of their civic engagement and their involvement in voluntary work, consistently with a new concept of citizenship: rather than a status granted through a top-down dynamics, a process fed by participation and the sharing of duties and rights. c) Encouraging migrants’ social participation and civic engagement (in particular their involvement in voluntary organizations), with the aim of building an inclusive society and of changing the common perception of migrants as people to be assisted. 2) the activation as volunteers of 100 migrants previously assisted by voluntary organizations. The cross-cutting analysis of all the research findings and experiences realized is contained in the volume The Diversity Value. 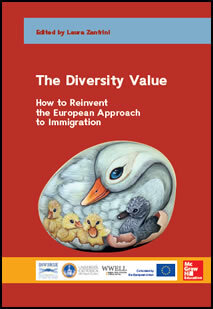 How to Reinvent the European Approach to Immigration, McGraw-Hill Education, Maidenhead, UK, 2015 (available online). Moreover each national team produced a report (click here to read and download) and a policy brief (click here to read and download) addressed to all the stakeholders who can play a role in the shared effort to achieve these strategic objectives. On 11 June 2015 the project final conference was held. 3) some of the experiences existing in Italy were presented directly by their protagonists. This project, for the wideness of its actions and the number of countries involved, represents one of the most important realized in Europe on these themes. It generated precious indications in the direction of a desirable “quality jump” of the Italian and European model of migrants’ integration. These indications concern crucial fields at the centre of the European agenda, and particularly strategic for Italy, where up to date the integration model seems to have even stressed the weaknesses of the European tradition. → Conference poster and Program.